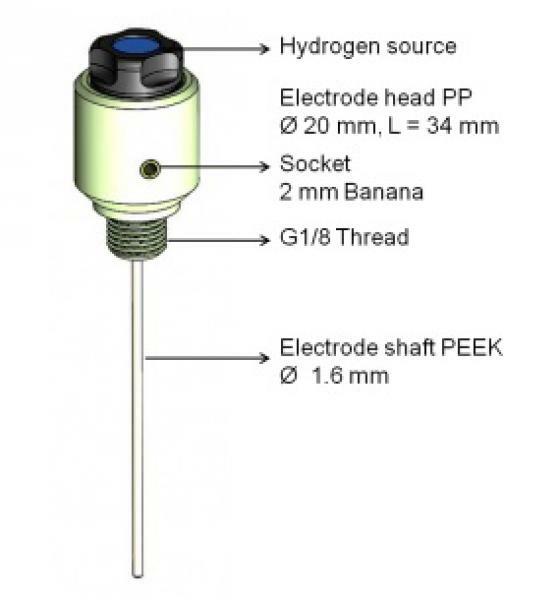 The ET096 is a small hydrogen electrode. The head is made from PP and the shaft from PEEK. The diameter of the shaft is just 1.6 mm and the length of the shaft can be customized. The head has a G 1/8'' BSP thread but it can also be used without being screwed in. The connector lead is the same as used for the standard HydroFlex electrode. The has a hydrogen generating button cell that lasts 12 months and can be replaced with the ET097 Replacement Hydrogen Source. The head is made from PP and the shaft from PEEK. The diameter of the shaft is just 1.6 mm and the length of the shaft can be customized.